When you start researching doing SEO right you’ll find plenty of sites that will share “100 Ways To Do SEO Right” or “Top 50 SEO Tips”. Then when you read the advice a lot of it is just various tips that may or may not even be helpful in the next 3-6 months since Google and other search engines are constantly changing their algorithms. So what are the core SEO (Search Engine Optimization) tips that will always remain the same, no matter what Google updates? The best way to figure that out is to first figure out what Google ultimately wants. What they ultimately want is to be the authority when it comes to helping users find what they’re looking for so that users don’t use any search engine other than Google. Now, think about yourself as a Google (or other search engine) user – what do you want? You want to use a search engine that will answer your question or find you the product that you’re looking for quickly and efficiently. You don’t want to click on 3 pages of SERPs (Search Engine Results Pages) before you find the site you really want. Now think about those 2 things and then think about these three “evergreen” tips for doing SEO right. 1) Creating relevant content that not only converts but is also meaningful for your site visitors. As I mentioned earlier – Google is a search engine that’s in the business of providing quality information returns to their users so that these users will keep coming back. If Google has your page ranked highly at first, but a lot of visitors come and go quickly, then your quality isn’t as relevant as Google first thought it was, and they will knock you down the SERPs. The best part about writing relevant content is that no matter what Google does to its algorithm you’re not scrambling to reverse anything you’ve been doing because you’re already providing value to your visitors. As Google gets better at recognizing your valuable content, your rankings will improve. And when you’re writing great content for your site your site visitors are staying longer, they’re clicking on more pages on your site, and they’re converting – so it’s a win-win. 2) Play By the Rules – don’t use grey or black hat techniques that may eventually get you penalized. 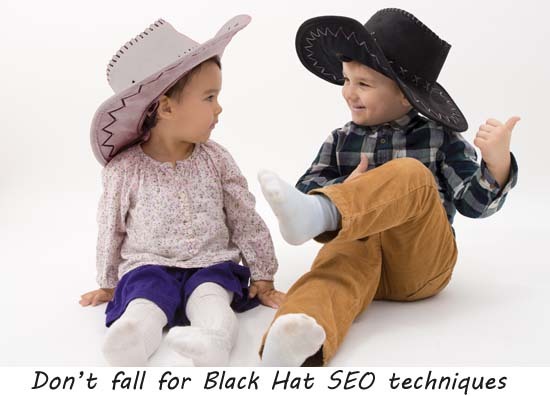 What are grey/black hat seo techniques? Keyword Stuffing – gone are the days when you could just add a list of keywords to the bottom of your pages and Google would count that in your favor. Not only is keyword stuffing bad design, it tends to make your content look sloppy to your visitors and it won’t end up converting them, even if you’re in a top placement in the SERP. Sloppy Backlinking – when you go out in search of sites that may link to your own site, don’t just scatter your links everywhere (and definitely don’t work with a Link Farm or an agency that promises you “hundreds of backlinks”). Look for sites that are complementary to yours – and then work together with them to create the links that will help both of you. Also, make sure that you don’t have a lot of bad links to your site that you may not have even asked for – Google puts the responsibility on you to make sure your backlinks are clean. To find out who is linking to your site, use your Google Webmaster Tools. No Tricks – you’re a smart person, if something seems too good to be true it probably is. Building up great SEO takes time – sometimes 6-9 months – it’s a series of content development, promotion and good coding. If you’re approached by a company that even whispers “we’ll get you #1 in Google in 5 days” run. They’re not interested in helping you build a long-term online presence – they’re interested in pulling off whatever tricks they can, have you pay them while you’re still impressed, and then run away after you’ve been blacklisted by Google. 3) Make sure your site is responsive. The world is becoming more mobile. Where once you only had to design for PCs, now your visitors will come to you via smartphones, laptops, tablets, etc. Google recognizes this and has started to make changes to their algorithm to penalize sites that don’t accommodate mobile visitors so make sure your site works on all mobile devices. As with your site’s content, having a site that is mobile-friendly will only help your business in the long run. Most users now are on a mobile device when they’re starting to do research – if your site can’t be seen properly on a mobile device those visitors won’t wait to get in front of a PC to visit your site again – you will lose them forever. Yes – there are plenty of OTHER SEO tips out there that are great to follow – in fact, here are 55 Tips but if you have limited time and can only focus on a few, the three tips above will make sure you’re doing SEO right the first time. Here’s a “freebie” that most designers forget – make sure you use your image alt tags to your advantage. If you have an image on your page, Google doesn’t know what it is unless you use the alt tag to tell them what it is. So if you’re writing a travel article about Norway and your image is of one of the Norwegian Fjords, then use the alt tag to say “Travel to Norway to See the Norwegian Fjords” – don’t miss the opportunity to reinforce your content through your images as well.